After a nail biter of a recount in a fiercely contested proxy battle, activist investor Nelson Peltz narrowly won a seat on the board of Procter and Gamble, the Cincinnati-based consumer products giant known for classic household brands like Pampers, Tide, and Crest toothpaste. Everyone agrees that the company has been underperforming. The CEO argues that the turnaround is already in progress, but Peltz wants more aggressive action. (P&G may be challenging, or at least reviewing, the recount). Peltz wants to restructure P&G into three business units, which some suggest is a prelude to breaking up the company. This would seem a real risk. Peltz also earned a seat for an ally on GE’s board, and that company is already looking to sell off many longstanding businesses, including its historic Edison lighting division and locomotive business. In GE’s case, this is being undertaken by a new CEO, but it’s not hard to imagine Peltz making similar pushes here. USA Today reports that Peltz deals have led to 100,000 total job losses. 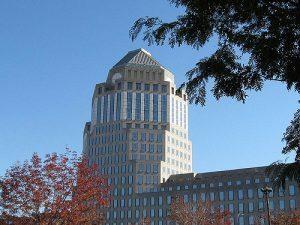 Reports suggest P&G employs 12,000 people in Cincinnati, so corporate job cuts would hit the city hard. There’s also the possibility that Cincinnati could see a loss of P&G divisions or senior management jobs. When P&G spun off Duracell in 2014, the new company set up shop in Chicago, not Cincinnati. Duracell came via P&G’s Gillette acquisition, so it’s not clear that those jobs were ever in Cincinnati. But clearly other cities are going to be bidding on any future spin-off entities. When I left Indiana University, P&G was considered an absolute premier employer for new grads. I presume it still is because the company is a brand management legend. But it’s another thing entirely to try to recruit globally elite senior level talent to Cincinnati. Let’s be honest, that’s tough for most cities outside the usual suspects. I even hear people in Minneapolis complaining about recruitment challenges. I would not expect P&G to relocate its headquarters, but I would not be surprised at all if the company followed in the footsteps of Anheuser-Busch and started hiring more senior level people into new/expanded offices in Chicago (most likely) or New York or London. As with A-B in St. Louis, the bulk of the employees might remain in Cincinnati, which is an excellent corporate back office location where companies like GE are actually opening new service centers, but there could be a loss of top-level firepower. Nothing may ultimately happen, but P&G realistically has nowhere to go but down in Cincinnati. Midwest cities have remained very reliant, particularly in their downtown employment bases, on legacy employers like P&G, A-B, Eli Lilly in Indianapolis, etc. But in a dynamic economy, it’s only a matter of time till something disrupts them. That’s normal. That’s why these cities need to constantly be creating new companies that hopefully grow to be tomorrow’s P&G over time. That’s the big challenge facing these mid-market cities. Here’s an interesting question: Is Chicago’s appeal primarily amenities-based or is it based on having more career opportunities than other Midwest metros? I’m inclined to believe it’s the latter. I think people prefer Chicago because you can make a lot of vertical career moves without having to transplant yourself to another metro. In terms of amenities, I think day-to-day living for most people in Chicagoland is the same as it is in other big Midwest metros. It’s easier to live car-free in Chicago if you work in the Loop, I guess, but otherwise I feel like Chicago is a typical Midwestern place – there’s just more “there” there than anywhere else in the Midwest. The only takeaway I can cull from that belief is that maybe cities like Cincinnati should be more worried about jobs than light rail or urban apartments. Not to say that light rail or urban apartments can’t help attract more jobs, but if you’re not careful you can put the cart way before the horse. As we see in Dallas and Houston, get enough jobs and the rail lines and apartments will follow. @Mark Hansen – Chicago’s advantage over other Midwest areas is definitely a mix of amenities and career opportunities. In fact, for young college grads, I honestly think the amenities are a bigger draw than the career prospects. If you’re comparing suburban Chicago to other Midwest metros, then you *might* be able to say that there isn’t a huge day-to-day difference from other Midwest metros (although I’d still generally disagree). For people living in the “Global Chicago” portion of the city (the North Side plus the neighborhoods adjacent to the Loop), there absolutely isn’t any comparison to other Midwest cities (and arguably nothing comparable urban-wise in the United States with such scale other than New York City). It’s a pretty massive difference in amenities and I’d argue it’s a much larger difference between Chicago and the rest of the Midwest compared to any other primary US city and the rest of the cities in its region (e.g. Boston, Philly and DC are still competitive with NYC; the Bay Area is as much of a driving economic force on the West Coast as LA is; Atlanta has strong competition in the Southeast with Charlotte, Raleigh-Durham and Nashville, etc.). @Frank the Tank: What can you do in Chicago on a day-to-day basis that you can’t in Cleveland, St. Louis or Minneapolis? Back around 2000, Chicago had real urban neighborhoods while those cities were full of ghost towns. But I think since then the other big Midwestern cities have done a lot of catching up to Chicago. There’s not as dramatic of a difference as there used to be. It’s mostly just that Chicago will always have more neighborhoods, for what that’s worth. I also think that the majority of Chicago’s urban neighborhoods would be a dime-a-dozen on the East Coast. It’s more competitive with East Coast cities rather than a clear-cut better destination. I don’t think many Midwesterners appreciate how even random East Coast cities like Wilmington, Delaware are full of row houses. A lot of Midwesterners I know don’t view Chicago as the premiere urban getaway like they used to in the ’90s. There’s a lot more competition now. You don’t have to go to Chicago to get an urban experience. Yes, it’s bigger than any other Midwestern city and has the best museums. And for some professional fields, it’s also the best job market. But that’s where its advantages end, and it flat out costs more to live there. I know people who drive from Cincy to Chicago to see plays, concerts, exhibits, conventions, etc. they can’t find any closer. I’m confused by your comments. Chicago is more prominent on the radar of professional Ohioans than it was 20 years ago. Most of the Midwesterners I know are more proud of their regional big city than they used to be and less enamored with Chicago. They still appreciate Chicago for having the best of class museums and transit and for having rich, deep subcultures, but aren’t as blown away by it as they once were. Certainly they don’t seem prepared to pay for the higher cost of living for the occasional concert. But that’s just my anecdotal experience. We obviously know different people. Chicago’s appeal is a big roster of food and consumer goods companies (industry cluster), a base of high end professional services, and a major international airport. I actually think the talent matter relative to the typical fear that “Chicago is sucking up all the young talent in the Midwest” is overblown. The bigger issue is attracting senior talent that’s already in a global city and convincing those people to move. The impact to Cincinnati if Peltz succeeds is the same as the impact brought by every other “activist” investor or corporate raider since the Reagan era — devastation in the name of making a few people rich. There are those who like to divide the economy into makers and takers, with the rich always the makers (or “job creators”). But Peltz and his ilk are nothing but takers. They don’t make anything (“R&D is a hobby”) — they strip-mine companies to put even more money into their hands, with no regard for customers, workers, the world economy — no one but themselves. I do get that these takers often started as makers. But at what point are those makers-turned-takers harmful? Look at Jeff Bezos. The man is now worth $100 billion, yet localities give him obscene breaks, to the detriment of their community services, to locate facilities there, and the “winner” of HQ2 is probably going to give away so much that in the end the deal is net negative. And the tax plans making their way through Congress would codify this further. P & G’s insularity echoes Cincinnati’s. It’s so powerful that it even crosses class and, to a lesser degree, race. Cincinnati doesn’t have anything like the internal hostilities we’ve seen in St. Louis, for example. This means that you can live in Cincinnati and simply not come into contact with key dynamics of american society in a way I’ve never encountered in other midwest/upper south cities. For example, there is almost no visible glbt life in Cincinnati even as neighboring metros like Columbus and Louisville sprout new and varied social and professional possibilities for glbt people. P & G can’t let itself get dragged down by Cincinnati. I wonder about Kroger and Macy’s Cincinnati operations as well. I’m curious why you say there’s no visible GLBT life in Cincinnati. Local bars have gone through a downturn, but that’s a national trend, and we have other things like the gay softball league, the men’s chorus, MUSE, the gay bowling league… heck, Tristate Leather Weekend just happened at a downtown hotel. Pride’s gotten bigger every year for the past decade. There are no gay bars in Cincinnati. It’s not just a “downturn.” Gay bars haven’t disappeared from Columbus or Louisville.They have become more diverse and visible. http://www.pridesource.com/article.html?article=81861. The numbers back me up. So do my experiences. It IS the “Men’s Chorus” not the GAY Men’s Chorus. They can’t even bring themselves to use the word. A friend on the gay softball league was complaining that half his team mates are openly straight and that his gay friends won’t participate anymore because it doesn’t offer the sense of gay camaraderie, or the potential flings/dates/boyfriends, they used to find in it. The leather event is a private fetish festival, not a particularly public or visible glbt thing. Gay life in Cincinnati is easily the most limited of any comparable metro in America. It’s a symptom of an insular place that is simply uninterested in larger social trends. That insularity can’t but hurt companies that concentrate their leaders and decision makers in Cincinnati. As a person who is gay and lives in Cincinnati I must disagree with much of what you said. Cincinnati and Northern Kentucky has gay bars. My personal experience, has been very different then yours. If you don’t have experience of other cities, I’m you can’t use your own experiences to make a meaningful comparison. There must be some reason that Cincinnati has fewer people identifying as GLBT than almost any city in America. It’s just one more sign that Cincinnati is not a place to locate if you want to be part of change. I meant to say that if you don’t have experiences of other cities, you can’t use your own experiences to make a meaningful comparison. Cincinnati clearly has a much more limited expression of glbt life than any metro it’s size or larger in America. Explaining why is one thing, offering this as an example of the limitations of operating from Cincinnati is another. Cincinnati and Kentucky are famously socially conservative, a turn-off regardless of whether you are LGBT, Black or Vietnamese American. An article in either the New York Times or Washington Post this last weekend discussed how the Republican party has permanently lost Millennials, even libertarians, because of its stand on social issues and anti-immigrant fervor. You just can’t attract young talent if you look like a bunch of white family guys, and if your primary security for paying back big college loans is your network of talent, you’re not going to strand yourself in a backwater where you are too far away from your friends to here about new jobs, or even work alongside them at the same company. I’m sure young people still go to P&G to learn brand management, but if you’re a young person interested in marketing, there are now lots of opportunities for that in tech, and that means that you no longer have to maroon yourself in Cincinnati for several years to get experience. Yet Louisville has much more to offer glbt and progressive people than Cincinnati. This is a Cincinnati specific thing. Even Dayton has a *far* more vibrant LGBT scene than Cincinnati does – as far as I know Cincy only has two gay bars within city limits, while Dayton has at least 5 despite being a significantly smaller city/metro. I won’t go so far to say that Cincinnati is “openly hostile” to LGBT people as they were in the 80s and 90s, but it’s definitely not a visible subculture the way it is in Columbus, Dayton, or even Cleveland. I’ll admit that even in Cincy, the younger generation doesn’t care as much about sexual identities as previous generations did. Still, I don’t know of a single gay bar in the city of Cincinnati, though many bars won’t hassle glbt people anymore if they are ‘discrete.’ In theory, you can be openly gay in Cincinnati but it’s not easy in practice. Other than online, there simply isn’t any place in which to “be” gay publicly. Gay life happens in very private social circles in Cincy. I think the glbt example is evidence of something very distinctive going on in Cincinnati, but it’s not just with respect to glbt people and activities by any means. Cincinnati’s social, political, and economic establishment works to exclude new ideas and people in a way that doesn’t happen in other comparable metros in my experience. Cincinnatians seem to find a special power in their connections that they feel the need to ‘protect’ against ‘outside’ forces in ways I haven’t found in other American metros, not even in distinctive places like New Orleans or Boston. The closest parallel I’ve heard about came from a friend who moved to teach at a college in a mostly Mormon town in Idaho. He said everyone was pleasant to him, but that there was never any suggestion that he could be part of the community life in that town even though the question of his religious views was never even hinted at. He came to realize that they knew he wasn’t mormon even before actually talking to him. Cincinnatians are similarly able to distinguish locals. They seem to be able to tell even BEFORE they’ve actually met me; sometimes even before it seems that they could have been aware of my existence; that I’m not a local. The few who’ve made a mistake and assumed I was a local showed me how differently Cincinnatians treat each other versus outsiders. I think it’s at the root of all of Cincinnati’s problems, including the struggles of P&G. Off the top of my head there’s Below Zero, Main Event, and the Dock in the downtown basin. It’s not like they are secret or low key, Below Zero and Main Event fly rainbow flags. Don’t know about the Dock as I’ve never been. ^ I forgot about Main Event, Below Zero and the Dock are the two most known, and there’s also On Broadway over by the casino. Outside of the question of public spaces for glbt people, I agree strongly with Matt’s statements. I moved to Cincy 9 years ago, and currently split my time between Dayton and Cincy with most of my time in Cincy. I recently had a discussion about meeting people in Cincinnati with friends, and everyone (~6 people) went around the room and listed the number of friends – not even close ones – that were Cincy born and raised. There were maybe 3 people we could name among all of us. Naturally, all of us moved to the city, but together we had about 30-40 years of living here. I’ve been spending time in Dayton for the past year and half, and found that I can make friends with people who spent their high school years here. I suspect the population churn from WPAFB helps. On Broadway is gone. Main Event is downright dangerous. My friend was mugged IN THE BAR last summer. I doubt that even half of the customers at the other bars are gay.They are ‘gay-friendly’ or ‘gay-inclusive’ but not targeting gays. I tried to talk to a handsome man at below zero about a year ago. He looked confused as I said I thought he was handsome. Looking over his shoulder awkwardly,he said, “i’m not into guys…but that’s great if you want to be. Where do you gay guys meet each other in Cincinnati,” he continued. A few minutes later he was pointing at me and laughing as he presumably replayed our conversation to his buddies.These are not the comments of someone who thinks they’re in a gay bar. He was right. He wasn’t in a gay bar. A woman aggresively hit on me as I left the bar feeling dejected that night. Below Zero isn’t a gay bar, though I suppose you could call it an “alternative bar.’ I can assure that gay men are not making social connections there. America’s “top talent” is overwhelmingly the product of wealthy families whose parents paid for college, who paid their NYC rent during an unpaid internship, etc. So the low cost of living in places like Cincinnati and St. Louis is of no interest to them.